Srinagar, June 08 (KMS): In occupied Kashmir, Hurriyat leaders expressed solidarity with people of Kashmir and Palestine. Brussels, June 08 (KMS): The Chairman of EU-Pak Friendship Federation, Chaudhry Perveiz Losar, organized a Kashmir conference in collaboration with the Members of European Parliament Wajid, Alex Mayer, Julie Ward, John Howarth and Sean Simon Anthena. Srinagar, June 08 (KMS): In occupied Kashmir, intelligence sleuths have recently interrogated teachers and scholars at the Kashmir University in Srinagar for their alleged role in instigating students against the puppet regime and preaching radicalisation. Srinagar, June 08 (KMS): In occupied Kashmir, the Chairman of Jammu and Kashmir Liberation Front, Muhammad Yasin Malik, has said that pro-India Peoples Democratic Party (PDP) and its partner BJP have unleashed a reign of terror against the people of the territory from last four years. Srinagar, June 08 (KMS): In occupied Kashmir, Dukhtaran-e-Millat (DeM) has strongly condemned the extension of police remand until 21st June against the party chairperson, Aasiya Andrabi, and her associates, Nahida Nasreen and Fehmeeda Sofi. Srinagar, June 08 (KMS): In occupied Kashmir, Anjuman Shari Shian and the Jammu and Kashmir Salvation Movement (JKSM) observed Jumatul Vida, last Friday of Ramadan, as Al-Quds and Kashmir Day. Srinagar, June 08 (KMS): In occupied Kashmir, Kashmir and Palestine Day is being observed, today (Friday), to impress upon the United Nations and the international community to fulfill their commitment to resolve the two disputes in accordance with the relevant resolutions of the World Body. Call for observance of the day has been given by the Joint Resistance Leadership comprising Syed Ali Gilani, Mirwaiz Umar Farooq and Muhammad Yasin Malik. 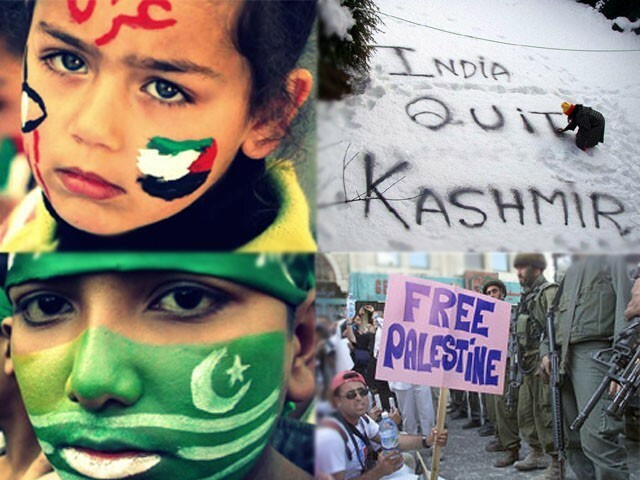 A resolution calling for an end to military occupations in Kashmir and Palestine will be presented in all mosques, shrines and imambargahs across the territory during Juma congregational prayers. The resolution urges the world to take serious notice of the brutalities perpetrated by the Indian and Israeli occupation forces in Kashmir and Palestine. Srinagar, June 08 (KMS): In occupied Kashmir, the Hurriyat forum led by Mirwaiz Umar Farooq, has strongly denounced the summoning of women and girls to a police station in Islamabad district terming it ultimate highhandedness of the Indian police, especially by an officer-in-charge of the district.